Attention: From Gocdkeys we can buy the best prices for the new Apex Coins, for the new and brand-new Battle Royale of EA. Like many free2play games, it's now possible to buy coins or funds for Apex Legends, a new battle Royale that is causing a furor, and even to the point of becoming a serious competitor to Fortnite. This version of the Apex Coins are for Xbox One and must be activated through the Microsoft account. With the Apex coins we will be able to access extra funds for our balance in the game. With the ingame money we will be able to access the purchase of certain visual aspects for characters and weapons directly. We can also use Apex coins to buy Apex packs, cosmetics and to unlock new characters in the game store. Remember that to be able to add these funds in our account it is necessary to have the game in our account of Xbox One and to have, of course, an account of Microsoft valid for the activation of the code of the Apex Coins. 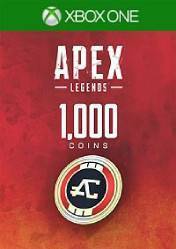 There are no comments yet about Apex Legends 1000 Apex Coins. You can be the first one!